These are very clear and accessible ways of viewing information. My brother and his age group expect visual and interactive data given the culture we live in, and the use of maps is something I definitely want to take forward in the project. This map of the locations where child labor happens around the world presents a complex issue in a way that is very simple and easy to understand. 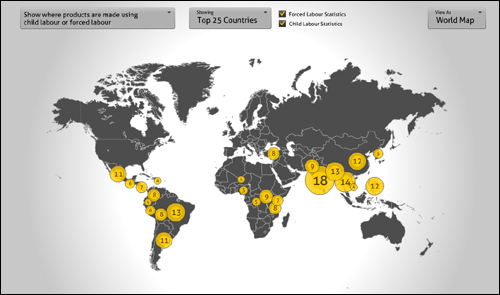 Site visitors can view the top 25 countries where products are made with child labor and also toggle between the map view and several graph views. This New York Times map that displays census data on race in America is most notable for showing just how many neighborhoods are clearly divided by race. For example, Manhattan’s 95th street has mostly White residents on one side and Black and Hispanic residents on the other. Los Angeles’ Santa Monica Boulevard creates a similar divide — a large percentage of residents who live north of the avenue are White, while the majority of those who live south of the street are Hispanic, as evidenced by the colored dots. Roshini Kempadoo’s digital images and Internet site ‘Virtual Exiles,’ explores the experiences of individuals who have left their country of origin and who are now at ‘home’ in another. The reason and experience of having left a homeland always varies, but what doesn’t is the relation to the host country – those having migrated are nearly always considered to be an ‘outsiders’ or ‘foreigners’. The work was created by Kempadoo while investigating her own status as refugee/exile/expatriate/emigre in relation to her own country of birth England and her country of origin and upbringing, Guyana. The interactive website was an ongoing curated internet show where individuals and groups are encouraged to contribute their own artwork. Whether it is a sound, video or a multimedia piece or a series of images or text, the person is invited to contribute their own experience of being ‘settled’ and ‘rooted’ within one culture and yet having a deep sense of belonging with another. Such contributions alongside Kempadoo’s own work are then contextualised and presented as four separate portfolios, each of which focuses on particular aspects of the ‘exiled’ experience. Looking at Kempadoo’s work gives me a good insight into how themes surrounding belonging, rootedness and identity can be represented using new media technology. I particularly like the participatory aspect, and ideas of space and place. I think notions of space are particularly important when speaking about globalisation and virtual space. Kempadoo’s work also makes me think about the end presentation of the work, whether it should be presented as an art piece? The project could take on a research form in this respect, aggregating different sources and displayed to an audience as an exhibition. ‘Her work is very significant because it highlights the cultural mix of the Caribbean often lost in translation to the UK. Her work is trying to restore the complexities of Caribbean history through sometimes an autobiographical investigation. What is very provocative about her work is that it offers us a complex set of relationships that we as audience not only enjoy unpicking because it is full of diffuse humour but also because it recognises complex relationships between the present and the colonial period of British expansion’. I really want to explore these complexities in my work in relation to racial identity. I should note the complexities in translating these experiences, and question which method will best allow this discussion to be understood. Regarding this then, the audience play a crucial part in the work. I also like the autobiographical element, which is something I want to do in exploring my own identity. Perhaps I could do this in relation to other people. 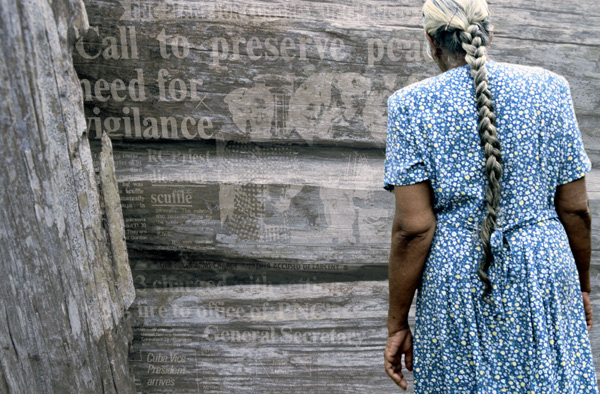 Conceived as an ever-changing work-in-progress ‘Virtual Exiles’ begins with the narratives of people whose origins are in Guyana. The aspect of the work forever changing is quite crucial, and links into my ideas of racial identity being changeable and all the more complicated due to this. Matt Locke writes, ‘Roshini Kampadoo’s ‘Virtual Exiles’ is an ambitious attempt to create a forum for a number of issues that have been central to her work – identity as refracted through labels such as refugee, exile, expatriate and emigre; photography as taxonomic tool or emotional record; and the infrastructures of commerce, colonisation and globalization that replicate themselves in the technologies used to construct her work. I definitely think in some ways, I am trying to create a forum around my work, in that my aims are for such issues to be discussed, challenged and experimented. Again, the notion of collectiveness and participation seems central to producing work of this style. I feel that the work is stronger also in that it has a collective story and not simply the experiences of one person alone. You then begin to find recurring themes in experiences, as well as identifying differences also. I also like the notion of existing in two spaces at once, and see parallels here with existing both online and offline, and the way the two interact. The work does not attempt to recreate a taxonomic archive but to present narrative spaces that reveal themselves through a series of breaks and ruptures – rollover images, scrolling shockwave texts and hidden links that require more persistence than the usual navigation tools. I also need to think further about the form of the work, what type of experience do I want to create for the audience and why?